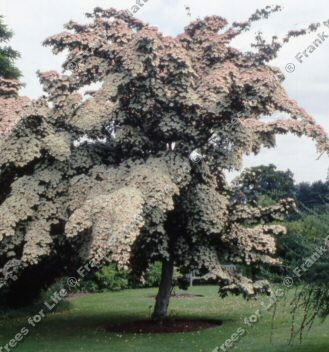 Chinensis (Cornus kousa 'Chinensis') is an elegant small dogwood tree. It is at its best in autumn, when its rich bronze and crimson autumn foliage colours makes it a real eye-catcher. Spectacular large white flowers are another attraction in June, followed by strawberry-like fruits. This tree is supplied at a height of between 1.3 and 1.7 metres in a 7-12 litre container for year round planting and better results than from either bare-root or rootballed stock.